In this segment I would like to discuss perforations, mainly the Compound perforations. They are simply 2 different gauges of perforations on the same stamp. 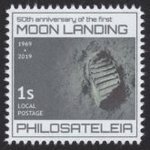 As a stamp collector, you know that when you see a "formula" of 10 x 10½ you automatically know that you will measure the TOP of the stamps perfs first and the second set of digits always refers to the side to the RIGHT, but do you know why they are different? -It was because the perforations sizes of the time were usually very small and unstable. they used all sorts of different methods (which we will discuss later) and odd gauges like 14, 16,even 18 but this caused many problems, mainly the stamps just would break away prematurely from the sheet and postmasters had a fit and wrote many letters to the government about it! A solution was needed. If the perforations was to large the stamps would be ripped and torn and a lot of wasted postage stamps were the result but, if they was too small they would fall apart in shipping or in ones pocketbook and/or desk and was messy. The answer was the compound perforation! The small perforations one way would allow for easy separation while the larger perforations would provide strength to the sheet. Please allow me to elaborate a bit wont you? First a little history on the subject- An Irishman named Henry Archer, who in 1847 invented the first method of separating stamps by what is known as the roulette process. 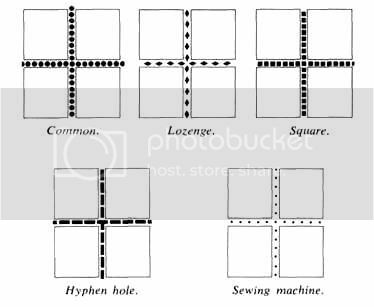 A time later, he improved on this with a new invention which made small holes all around the stamps which, of course, are known to us as perforations. Roulette-ing didn't remove any paper from the stamps sheets but rather only made a series of incisions. 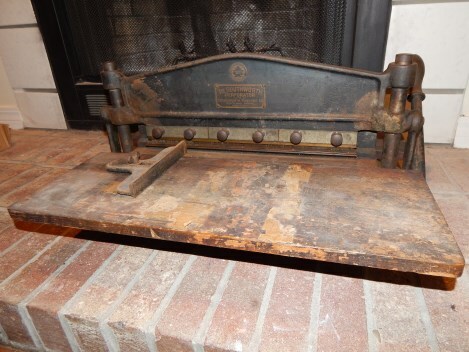 COMB perforater was a means of punching the top and all vertical perforation holes of one or more rows of stamps at a time. This is continued until all rows are punched. The top row punched will automatically provide the bottom row for the preceding row. A last extra punch will be required to put the bottom holes on the last row with the vertical perforations going through the lower margin of the sheet down to the bottom whereas the newer comb perforator machine perforates two rows "per stroke". GUILLOTINE perforator is a machine that makes only single line perforations. 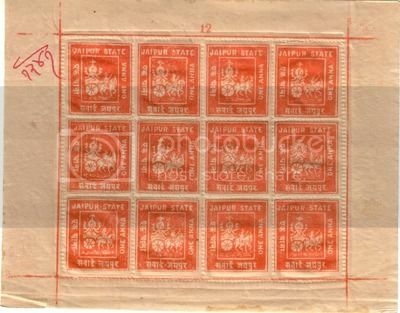 To distinguish line perforations from comb perforations the collector must look at the corners of the stamp. In a comb perforation the holes are separated from one another whereas in line perforations the holes may go over each other where the horizontal and vertical perforations converge. ROTARY perforator A process of making perforations in sheets or rolls by revolving wheels. This is operated first in one direction and then the other direction. INTERRUPTED perforations or SYNCOPATED perforations Caused by some of the punches of the comb being broken or missing. The removal of some of the perforation blades of the comb may be deliberate in order to overcome weakness of some papers. This is also purposely done to thwart counterfeiting operations like the modern day Machin. 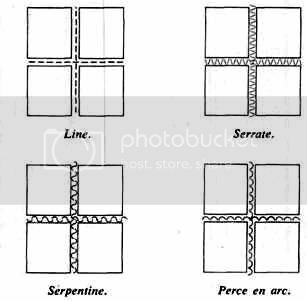 PIN or SEWING MACHINE perforations also known as PERCÈ EN POINTS. These are in reality just a type of roulette as the paper is only pierced and no material is removed. SQUARE perforations are small square holes usually close together as compared to the normal round holes. 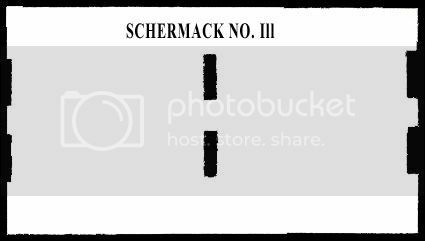 Usually from private companies like Schermack stamp vendor machines is a good example. ARC ROULETTE Are roulettes in the shape of an arc or semi-circle. DIAMOND ROULETTE or LOZENGE these are simply roulettes in rows and shapes of XXXX and usually resembling diamonds or lozenges. OBLIQUE ROULETTE Roulettes with short parallel slanting incisions. ROULETTE-IN-COLOR This is accomplished during the printing of stamps. The incisions are made into the paper by the use of a sharp edge and deeper penetrating part of the printing plate which also inks the cuts at the same time the stamps are made. Although on this particular sheet the perfs aren't inked they are, however exactly the same otherwise. SAWTOOTH ROULETTE the cuts resemble the teeth of a saw. The teeth form triangles compared to the rounded edged of the serpentine roulette that we haven't discussed yet. SEWING MACHINE ROULETTE Although have in fact made by the means of an actual sewing machine! 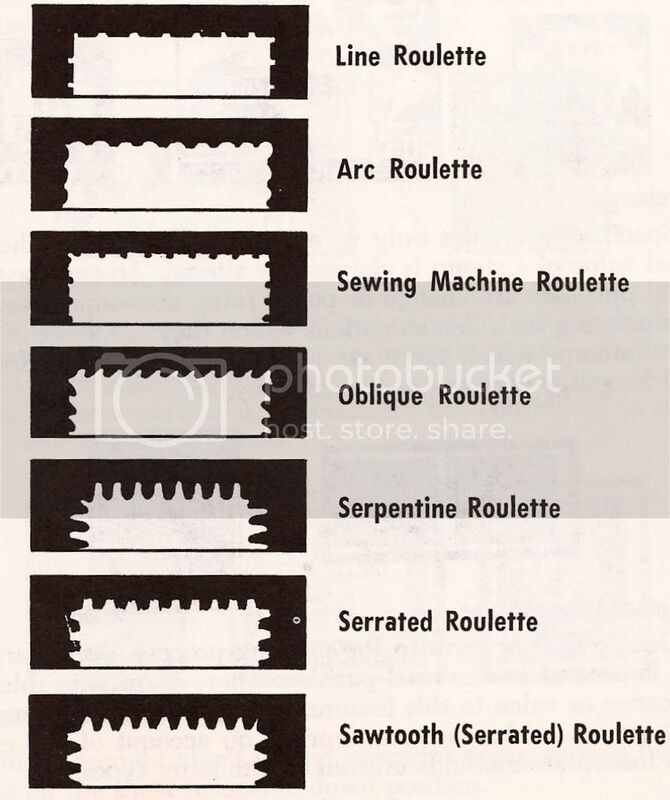 Most of the so-described sewing machine roulettes, though, are incorrect and in reality pin rouletted. Good for beginners like me, thanks. A good chance to review it once again. Post Craig. A great refresher course. Didn't know there were different type. Good to know. This is arguably one of the slowest means of perforating stamps since you can only do one row of perforations at a time.